This article is about the chemical element. For other uses, see Krypton (disambiguation). Krypton (from Ancient Greek: κρυπτός, translit. kryptos "the hidden one") is a chemical element with symbol Kr and atomic number 36. It is a member of group 18 (noble gases) elements. A colorless, odorless, tasteless noble gas, krypton occurs in trace amounts in the atmosphere and is often used with other rare gases in fluorescent lamps. With rare exceptions, krypton is chemically inert. Krypton, like the other noble gases, is used in lighting and photography. Krypton light has many spectral lines, and krypton plasma is useful in bright, high-powered gas lasers (krypton ion and excimer lasers), each of which resonates and amplifies a single spectral line. Krypton fluoride also makes a useful laser medium. From 1960 to 1983, the official length of a meter was defined by the 605 nm wavelength of the orange spectral line of krypton-86, because of the high power and relative ease of operation of krypton discharge tubes. Krypton was discovered in Britain in 1898 by Sir William Ramsay, a Scottish chemist, and Morris Travers, an English chemist, in residue left from evaporating nearly all components of liquid air. Neon was discovered by a similar procedure by the same workers just a few weeks later. William Ramsay was awarded the 1904 Nobel Prize in Chemistry for discovery of a series of noble gases, including krypton. In 1960, the International Conference on Weights and Measures defined the meter as 1,650,763.73 wavelengths of light emitted by the krypton-86 isotope. This agreement replaced the 1889 international prototype meter located in Paris, which was a metal bar made of a platinum-iridium alloy (one of a series of standard meter bars, originally constructed to be one ten-millionth of a quadrant of the Earth's polar circumference). This also obsoleted the 1927 definition of the ångström based on the red cadmium spectral line, replacing it with 1 Å = 10−10 m. The krypton-86 definition lasted until the October 1983 conference, which redefined the meter as the distance that light travels in vacuum during 1/299,792,458 s.
Krypton is characterized by several sharp emission lines (spectral signatures) the strongest being green and yellow. Krypton is one of the products of uranium fission. Solid krypton is white and has a face-centered cubic crystal structure, which is a common property of all noble gases (except helium, which has a hexagonal close-packed crystal structure). Naturally occurring krypton in Earth's atmosphere is composed of five stable isotopes, plus one isotope (78Kr) with such a long half-life (9.2×1021 years) that it can be considered stable. (This isotope has the second-longest known half-life among all isotopes for which decay has been observed; it undergoes double electron capture to 78Se). In addition, about thirty unstable isotopes and isomers are known. Traces of 81Kr, a cosmogenic nuclide produced by the cosmic ray irradiation of 80Kr, also occur in nature: this isotope is radioactive with a half-life of 230,000 years. Krypton is highly volatile and does not stay in solution in near-surface water, but 81Kr has been used for dating old (50,000–800,000 years) groundwater. 85Kr is an inert radioactive noble gas with a half-life of 10.76 years. It is produced by the fission of uranium and plutonium, such as in nuclear bomb testing and nuclear reactors. 85Kr is released during the reprocessing of fuel rods from nuclear reactors. Concentrations at the North Pole are 30% higher than at the South Pole due to convective mixing. Like the other noble gases, krypton is highly chemically unreactive. The rather restricted chemistry of krypton in its only known nonzero oxidation state of +2 parallels that of the neighboring element bromine in the +1 oxidation state; due to the scandide contraction it is difficult to oxidize the 4p elements to their group oxidation states. Before the 1960s, no noble gas compounds had been synthesized. Compounds with krypton bonded to atoms other than fluorine have also been discovered. There are also unverified reports of a barium salt of a krypton oxoacid. ArKr+ and KrH+ polyatomic ions have been investigated and there is evidence for KrXe or KrXe+. 6] below −50 °C. HKrCN and HKrC≡CH (krypton hydride-cyanide and hydrokryptoacetylene) were reported to be stable up to 40 K.
Krypton hydride (Kr(H2)4) crystals can be grown at pressures above 5 GPa. They have a face-centered cubic structure where krypton octahedra are surrounded by randomly oriented hydrogen molecules. Krypton is mixed with argon in energy efficient fluorescent lamps, reducing the power consumption, but also reducing the light output and raising the cost. Krypton costs about 100 times as much as argon. Krypton (along with xenon) is also used to fill incandescent lamps to reduce filament evaporation and allow higher operating temperatures. A brighter light results with more blue color than conventional incandescent lamps. 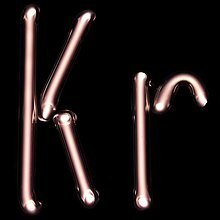 Krypton's white discharge is often used to good effect in colored gas discharge tubes, which are simply painted or stained to create the desired color (for example, "neon" type multi-colored advertising signs are often entirely krypton-based). Krypton produces much higher light power than neon in the red spectral line region, and for this reason, red lasers for high-power laser light-shows are often krypton lasers with mirrors that select the red spectral line for laser amplification and emission, rather than the more familiar helium-neon variety, which could not achieve the same multi-watt outputs. The krypton fluoride laser is important in nuclear fusion energy research in confinement experiments. The laser has high beam uniformity, short wavelength, and the spot size can be varied to track an imploding pellet. In experimental particle physics, liquid krypton is used to construct quasi-homogeneous electromagnetic calorimeters. A notable example is the calorimeter of the NA48 experiment at CERN containing about 27 tonnes of liquid krypton. This usage is rare, since liquid argon is less expensive. The advantage of krypton is a smaller Molière radius of 4.7 cm, which provides excellent spatial resolution with little overlapping. The other parameters relevant for calorimetry are: radiation length of X0=4.7 cm, and density of 2.4 g/cm3. The sealed spark gap assemblies in ignition exciters in some older jet engines contain a small amount of krypton-85 to produce consistent ionization levels and uniform operation. Krypton-83 has application in magnetic resonance imaging (MRI) for imaging airways. In particular, it enables the radiologist to distinguish between hydrophobic and hydrophilic surfaces containing an airway. Although xenon has potential for use in computed tomography (CT) to assess regional ventilation, its anesthetic properties limit its fraction in the breathing gas to 35%. A breathing mixture of 30% xenon and 30% krypton is comparable in effectiveness for CT to a 40% xenon fraction, while avoiding the unwanted effects of a high partial pressure of xenon gas. The metastable isotope krypton-81m is used in nuclear medicine for lung ventilation/perfusion scans, where it is inhaled and imaged with a gamma camera. Krypton-85 in the atmosphere has been used to detect clandestine nuclear fuel reprocessing facilities in North Korea and Pakistan. Those facilities were detected in the early 2000s and were believed to be producing weapons-grade plutonium. Krypton is used occasionally as an insulating gas between window panes. Krypton is considered to be a non-toxic asphyxiant. Krypton has a narcotic potency seven times greater than air, and breathing an atmosphere of 50% krypton and 50% natural air (as might happen in the locality of a leak) causes narcosis in humans similar to breathing air at four times atmospheric pressure. This is comparable to scuba diving at a depth of 30 m (100 ft) (see nitrogen narcosis) and could affect anyone breathing it. At the same time, that mixture would contain only 10% oxygen (rather than the normal 20%) and hypoxia would be a greater concern. ^ "Section 4, Properties of the Elements and Inorganic Compounds; Melting, boiling, triple, and critical temperatures of the elements". CRC Handbook of Chemistry and Physics (85th ed.). Boca Raton, Florida: CRC Press. 2005. ^ a b Haynes, William M., ed. (2011). CRC Handbook of Chemistry and Physics (92nd ed.). Boca Raton, FL: CRC Press. p. 4.121. ISBN 1439855110. ^ William Ramsay; Morris W. Travers (1898). "On a New Constituent of Atmospheric Air". Proceedings of the Royal Society of London. 63 (1): 405–408. doi:10.1098/rspl.1898.0051. ^ "The BIPM and the evolution of the definition of the metre". Bureau International des Poids et Mesures. 2014-07-26. Retrieved 2016-06-23. ^ Penzes, William B. (2009-01-08). "Time Line for the Definition of the Meter". National Institute of Standards and Technology. Retrieved 2016-06-23. ^ Kimothi, Shri Krishna (2002). The uncertainty of measurements: physical and chemical metrology: impact and analysis. American Society for Quality. p. 122. ISBN 978-0-87389-535-4. ^ Gibbs, Philip (1997). "How is the speed of light measured?". Department of Mathematics, University of California. Archived from the original on 2015-08-21. Retrieved 2007-03-19. ^ "Spectra of Gas Discharges". ^ "Krypton" (PDF). Argonne National Laboratory, EVS. 2005. Archived from the original (PDF) on 2009-12-20. Retrieved 2007-03-17. ^ Gavrilyuk, Yu. M.; Gangapshev, A. M.; Kazalov, V. V.; Kuzminov, V. V.; Panasenko, S. I.; Ratkevich, S. S. (4 March 2013). "Indications of 2ν2K capture in 78Kr". Phys. Rev. C. 87 (3): 035501. Bibcode:2013PhRvC..87c5501G. doi:10.1103/PhysRevC.87.035501. ^ Thonnard, Norbert; Larry D. MeKay; Theodore C. Labotka (2001-02-05). "Development of Laser-Based Resonance Ionization Techniques for 81-Kr and 85-Kr Measurements in the Geosciences" (PDF). University of Tennessee, Institute for Rare Isotope Measurements. pp. 4–7. Retrieved 2007-03-20. ^ "Resources on Isotopes". U.S. Geological Survey. Retrieved 2007-03-20. ^ a b c Kleppe, Annette K.; Amboage, Mónica; Jephcoat, Andrew P. (2014). 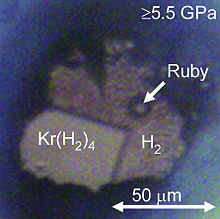 "New high-pressure van der Waals compound Kr(H2)4 discovered in the krypton-hydrogen binary system". Scientific Reports. 4: 4989. Bibcode:2014NatSR...4E4989K. doi:10.1038/srep04989. ^ a b Bartlett, Neil (2003). "The Noble Gases". Chemical & Engineering News. Retrieved 2006-07-02. ^ Grosse, A. V.; Kirshenbaum, A. D.; Streng, A. G.; Streng, L. V. (1963). 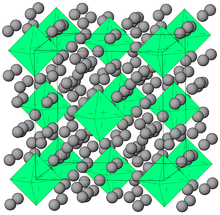 "Krypton Tetrafluoride: Preparation and Some Properties". Science. 139 (3559): 1047–1048. Bibcode:1963Sci...139.1047G. doi:10.1126/science.139.3559.1047. PMID 17812982. ^ Prusakov, V. N.; Sokolov, V. B. (1971). "Krypton difluoride". Soviet Atomic Energy. 31 (3): 990–999. doi:10.1007/BF01375764. ^ Streng, A.; Grosse, A. (1964). "Acid of Krypton and Its Barium Salt". Science. 143 (3603): 242–243. Bibcode:1964Sci...143..242S. doi:10.1126/science.143.3603.242. PMID 17753149. ^ "Periodic Table of the Elements" (PDF). Los Alamos National Laboratory's Chemistry Division. pp. 100–101. Archived from the original (PDF) on November 25, 2006. Retrieved 2007-04-05. ^ Holloway, John H.; Hope, Eric G. (1998). Sykes, A. G. (ed.). Advances in Inorganic Chemistry. Academic Press. p. 57. ISBN 978-0-12-023646-6. ^ Lewars, Errol G. (2008). Modeling Marvels: Computational Anticipation of Novel Molecules. Springer. p. 68. ISBN 978-1-4020-6972-7. ^ "How Products are Made: Krypton". Retrieved 2006-07-02. ^ Cardelli, Jason A.; Meyer, David M. (1996). "The Abundance of Interstellar Krypton". The Astrophysical Journal Letters. 477 (1): L57–L60. Bibcode:1997ApJ...477L..57C. doi:10.1086/310513. ^ "Mercury in Lighting" (PDF). Cape Cod Cooperative Extension. Archived from the original (PDF) on 2007-09-29. Retrieved 2007-03-20. ^ Properties, Applications and Uses of the "Rare Gases" Neon, Krypton and Xenon. Uigi.com. Retrieved on 2015-11-30. ^ "Laser Devices, Laser Shows and Effect" (PDF). Archived from the original (PDF) on 2007-02-21. Retrieved 2007-04-05. ^ Sethian, J.; M. Friedman; M. Myers. "Krypton Fluoride Laser Development for Inertial Fusion Energy" (PDF). Plasma Physics Division, Naval Research Laboratory. pp. 1–8. Retrieved 2007-03-20. ^ Pavlovskaya, GE; Cleveland, ZI; Stupic, KF; Basaraba, RJ; et al. (2005). "Hyperpolarized krypton-83 as a contrast agent for magnetic resonance imaging". Proceedings of the National Academy of Sciences of the United States of America. 102 (51): 18275–9. Bibcode:2005PNAS..10218275P. doi:10.1073/pnas.0509419102. PMC 1317982. PMID 16344474. ^ Chon, D; Beck, KC; Simon, BA; Shikata, H; et al. (2007). "Effect of low-xenon and krypton supplementation on signal/noise of regional CT-based ventilation measurements". Journal of Applied Physiology. 102 (4): 1535–44. doi:10.1152/japplphysiol.01235.2005. PMID 17122371. ^ Bajc, M.; Neilly, J. B.; Miniati, M.; Schuemichen, C.; Meignan, M.; Jonson, B. (27 June 2009). "EANM guidelines for ventilation/perfusion scintigraphy". European Journal of Nuclear Medicine and Molecular Imaging. 36 (8): 1356–1370. doi:10.1007/s00259-009-1170-5. PMID 19562336. ^ Sanger, David E.; Shanker, Thom (2003-07-20). "N. Korea may be hiding new nuclear site". Oakland Tribune. Archived from the original on 2016-04-09. Retrieved 2015-05-01 – via Highbeam Research. ^ Bradley, Ed; Martin, David (2000-03-16). "U.S. Intelligence Find Evidence of Pakistan Producing Nuclear Weapons, CBS". CBS Evening News with Dan Rather. Archived from the original on 2016-10-18. Retrieved 2015-05-01 – via Highbeam Research. ^ Ayre, James. "Insulated Windows 101 — Double Glazing, Triple Glazing, Thermal Performance, & Potential Problems". cleantechnica.com. Retrieved 17 May 2018. ^ Properties of Krypton Archived 2009-02-19 at the Wayback Machine. Pt.chemicalstore.com. Retrieved on 2015-11-30.